Resists water and smudges for clear, lasting prints. Maintain quality until the last drop, using built-in cartridge intelligence. Avoid surprises. Cartridge level tracking helps you know when a cartridge is getting low. 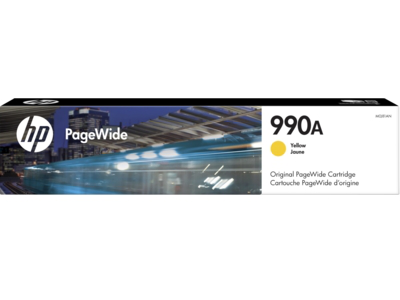 1 Based on ISO 24711 cartridge yields for HP 990X series High Yield Original PageWide Cartridges compared with HP 990A series Original PageWide Cartridges. Learn more at http://www.hp.com/go/learnaboutsupplies. 2 Water, smear, and fade resistance based on ISO 11798 and internal HP testing. For details, see http://www.hp.com/go/printpermanence. 3 Tested in HP PageWide Pro P750dw Printer. Average continuous composite cyan/magenta/yellow yield based on ISO/IEC 24711 or HP testing methodology and continuous printing. Actual yield varies considerably based on content of printed pages and other factors. For details, see http://www.hp.com/go/learnaboutsupplies.